The display has two parts to it - the numitron tube and 4 LEDs. The LEDs indicate what position is being shown (HHMM). The actual timebase is provided by a quartz crystal. One of the unique and cool features of this clock is that you can actually correct the time base to accommodate for changes in temperature, aging, etc. There is a coarse adjustment that adjusts in 2 second increments and a fine adjustment accomplished by adjusting a capacitor with a flat head screwdriver. The entire gadget is powered by 16F628 PIC microcontroller. If you're looking for a stocking stuffer for Christmas or need a nice little gift, this is the one to get. 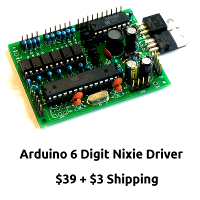 There are two things I like about this design: it is small and it has a black PCB. It is hard to emphases just how small this actually is - it is only about twice the length of the PIC microcontroller! This device is small and easy to mount. Just supply a modified USB cable for power and you can put this guy just about anywhere. I know it seems trivial, but compared to my NixiChron, this little thing is portable. Of course, the exposed black PCB will make all of your nerd friends jealous. I brought this clock (in kit form) after watching your review and I'm very pleased with it! Another feature that I've found with it is a 'test mode'. Try holding the button down as you power it up. Also, you can change the delay between the end of one display cycle and the start of another by incrimenting the first digit past 1. 2 = small delay to 0 = large delay.